This year a team of eight have been painstakingly working their way through close to 3,000 volumes, contained in the Green, Ante and Red Libraries. Longleat’s Assistant Librarian and Rare Books Cataloguer Matthew Baalham said: “We concentrate on the books which are closest to where visitors walk as this creates more dust. “We use special, low-suction vacuum cleaners and it takes between three and fifteen minutes to clean each book depending on age, size and how delicate it is – some exceptionally large and dirty books take longer. “I’d say the key requirements are concentration, attention to detail, and diligence, as well as knowing how to clean the books in a particular way,” he added. The libraries are among the finest in any private house in England. Approximately 130 books are known as ‘incunabula’ which means they were printed before 1500, the earliest dates back to 1470. Many of the books are extremely rare; ranging from 17th century political pamphlets through to a Shakespeare First Folio. Others, such as the ‘Book of Cookery’ published by Pynson in 1500 are unique, being the earliest known printed volume in English on the subject. The library’s origins date back to the 16th century, when the house was built by Sir John Thynne, and there are still books in the collection which were owned by him. 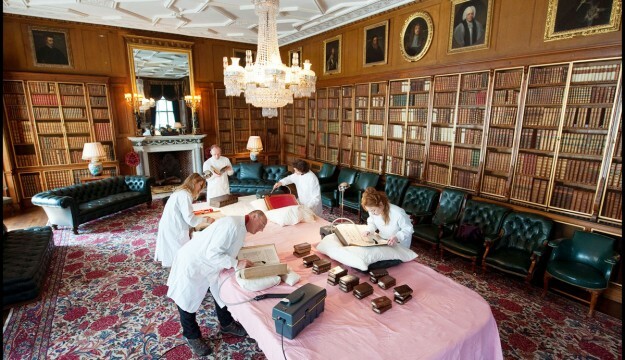 The library was greatly expanded through the prolific collecting of Thomas Thynne, First Viscount Weymouth, in the late 17th and early 18th centuries. Further additions were made during the 19th century by Thomas Thynne, Second Marquess of Bath, and John Alexander Thynne, Fourth Marquess of Bath, whose books are generally contained in the Green, Ante and Red Libraries.